Fabric Mart Fabricistas: Made by a Fabricista: (Faux) Persian Lamb and Floral Charmeuse...Lined, Padded, and Matching. Made by a Fabricista: (Faux) Persian Lamb and Floral Charmeuse...Lined, Padded, and Matching. Confession time, though...I already OWN a faux Persian lamb jacket, a black car coat that I purchased at Macy's in 2003. So why in the world would I want to make another one? Well, the colors that Fabric Mart offered were stunning, not the basic black that I owned, but a gorgeous light tan/golden color and a baby pink. 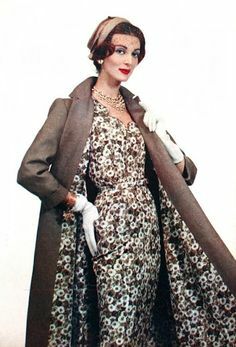 And since I love retro fashion, I knew I had seen many jackets/coats made in the mid-century from the more atypical hues. I chose to use the golden color, since I feel like it is more versatile, but I was very tempted to try the baby pink. In the end, I bought a small amount of the baby pink to make a coat for CW one day. I know that will thrill her! So even though I *knew* my schedule would be tight in February and March (I made my son a fully tailored blazer for his First Holy Confession in the last part of February--last photo, btw), I knew that the time and effort that would go into sewing up a fully lined, partially hand-sewn, vintage jacket would 100% worth it. And I think though you can tell I am tired in the above photo, you can also tell I am super excited to show off my new make. :-) (So much so I couldn't stop myself from posing like Lady A). Before we can get into the results of the process, I want to show you some of the things you absolutely must expect when working with this fabric. The results are rewarding, but there is a lot that goes into working with this velvet fabric (it is not like traditional faux furs, it is classified as a velvet). 1. It sheds after cutting, just as would happen with regular velvet. The faux high pile furs shed way worse, which is why you are told to cut into the backing only when working with those faux fabrics. You could cut into the backing of the lamb, but it really isn't necessary since the leftover bits aren't that difficult to clean up. 2. The velvet loses its texture super fast if you overpress. I only overpressed once, and I learned my lesson. From that point on I would briefly press, very gently, with a bit of steam, and then finger press. All of my darts turned out great, but to ensure they stayed flat, I stitched them down in the seam allowance to make sure they didn't flop out of place. Also, make sure to trim the darts and seams as much as you can without losing the integrity of the structure. The fabric quickly thickens up at seam junctures, so bear that in mind and try to limit your patterns to ones with fewer seaming details. I felt like the jacket I chose was a nice fit, enough darting and seaming to be interesting, but not too complicated and tailored to make fitting it and reducing bulk a nightmare. 3. I don't know about other faux Persian lamb furs, but the two I received from Fabric Mart were backed with a thick (I think--cotton/poly) backing. This backing was great...and made my life so much easier. It made marking the fabric very easy (more on that in the next bit of the post) and it was sturdy enough that absolutely NO interfacing or interlining was needed. Woo! 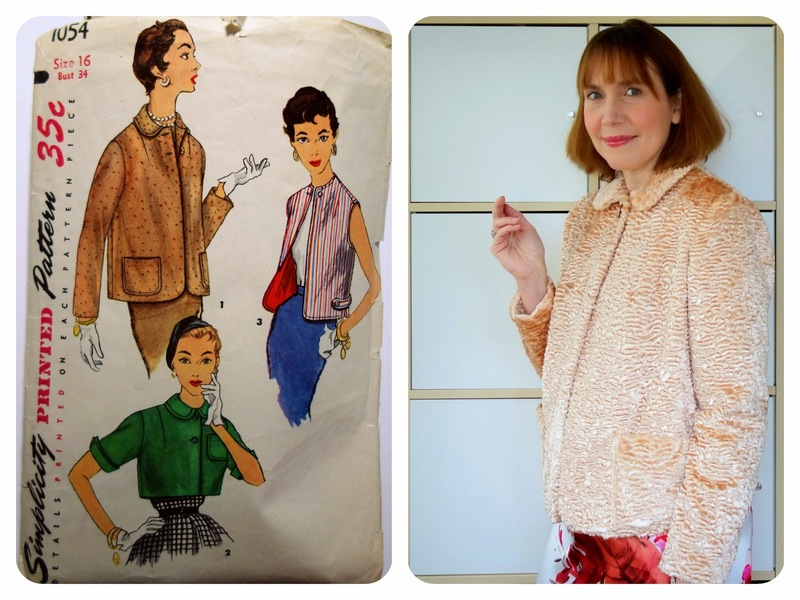 The job of making this jacket still took a ridiculous number of days (thanks, hand sewing! ), but at least interfacing and interlining were not part of it. 4. I bought a walking foot for my machine in 2013 right before I set out to make my daughter a Rapunzel costume which included a ton of velvet and tulle and lacy bits. Let me tell you, having that walking foot was amazing and made the job so much easier. This time I knew the machine would only have the walking foot (and straight stitch plate) on it so that I would be ensured of a fabric that maintains its "look," and seams that properly lined up. I am sure you can get away not using a rolling foot or walking foot, but from what I read there are lots of difficulties sewing velvet with a regular foot. (Crushed pile, uneven seams, fabric slipping all over the place, etc.) In addition to helping with the lamb, I also found it was great at helping with the poly charmeuse, which is the devil wrapped in a pretty package (talk about slippery and static-y nightmares!). So I mentioned the awesome backing to the fabric, and you can see above how it really helped when marking up the fabric. I used a tracing wheel (the serrated, cut you if you are not careful kind) and marking paper. If any of the lines ended up too faint, I went ahead and marked over them with the air erasable marker. The marks are CRUCIAL when making a jacket with a collar. If you are off, then your collar won't lay right or be in the right place. I am so glad that I was very diligent about the marking for both this jacket and my son's blazer. Both times the collar came out great, but I knew it was because of all the extra time I had put into marking them. On the right side of the fabric, you can't see any of the marks, so this is exactly the right method to use for this kind of fabric. The only thing that I absolutely needed on the right side was the pocket to be marked, so I thread traced the pockets using a navy thread so it would be seen and when the time was right I could place the pockets on the front properly. Above are the pieces I sewed up and some details. I decided to add the dress after seeing I had about a yard and a quarter left over. 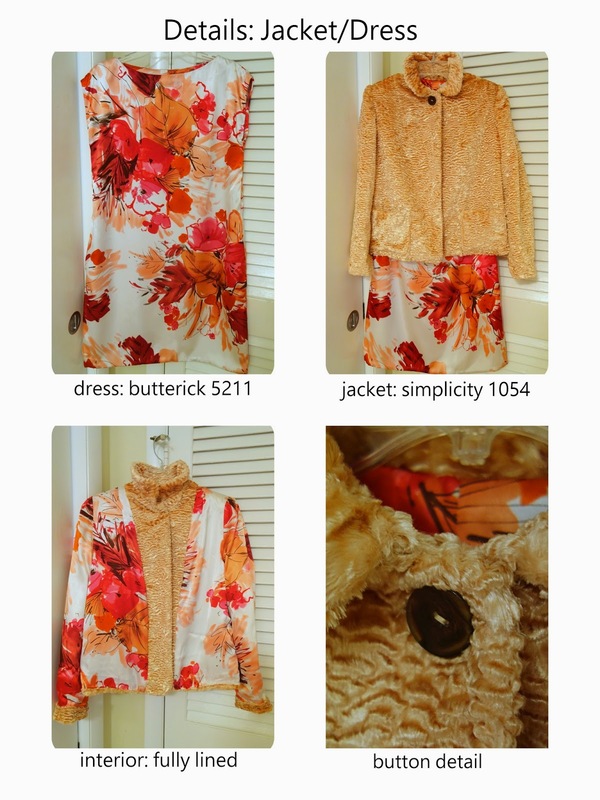 I had always wanted to try Butterick 5211, and this seemed the right time to do so. I had to interline it with a white poly so it wouldn't be too sheer, and because the poly charmeuse shows every hiccup in stitching, that interlining was great so I could attach my hand sewn hem to it instead of the main fabric. The jacket called for a full lining and a proper facing. I kind of love the interior shot of the jacket, it looks so "finished." It also called for two buttons, but I ended up only using one. I may add another, but for now the one is fine. I chose not to topstitch the collar and edges since that would be a whole lot going on with this fabric, but if I do make it up ever again (unlikely! ), I would topstitch then. By the way, I ended up purchasing the Simplicity 1054 from an etsy seller in size 16, which correlates to a bust of 34". The pockets are patch pockets, and they are lined in the floral charmeuse as well. It is a peek, only visible when you go digging. The shoulders are certainly "present," eh? I have square shoulders and typically shy away from using shoulder pads, but the pattern called for them and without them, the upper part of the bodice would have looked sunken, so I am glad I went with them. I actually kind of like how it looks, and may have to try more patterns that call for traditional shoulder pads. I almost entitled this post "Her Lining Matches Her Dress!" I really did hope to have enough lining fabric left over to make a dress since I really wanted to be like this lady here. I think though I am decked out in brighter colors, we have a similar "look." From the side you see that I took the hem up on the back a bit to correct for my sway back/large bottom/erect posture/whatever you want to call it. 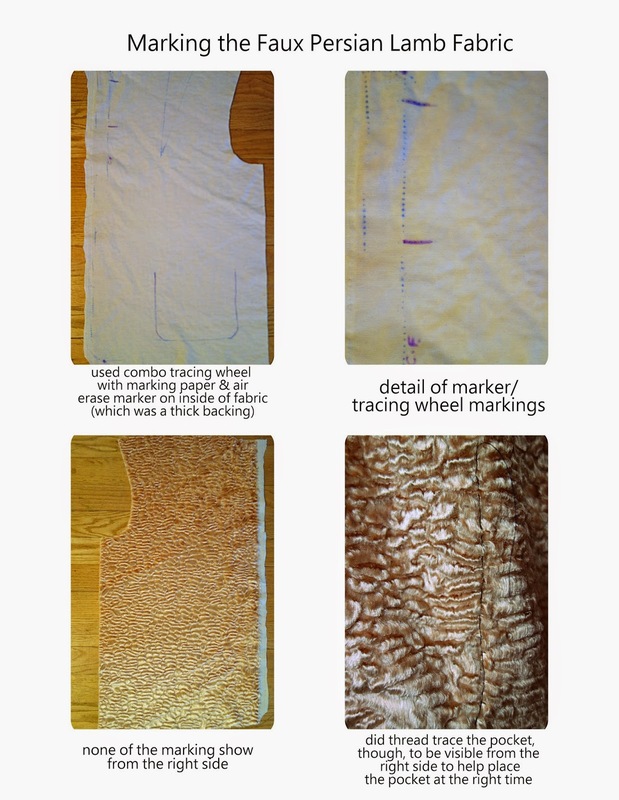 I am excited that it worked and my jacket looks clean from top to bottom with nothing excessive in the way of drag lines or wrinkling (that wouldn't be there otherwise as part of the design and for "ease"). A smooth unlined back. YES! It worked! Of course now I can see diagonal drag lines on the right arm. Darn. I assume those are from a larger arm circumference than I need or I set the sleeve in just a touch wrong. Hmm. My grandmothers would be proud of me wearing this coat. I am confident both of them had a version of this in their wardrobes. The fabric is so pretty, though, all those big florals and leaves in super saturated pinks and oranges and pure optic white. Right now Fabric Mart does not have this fabric, but they do have a lot of charmeuses with floral designs (including a silk charmeuse that I purchased to make another dress from one day). 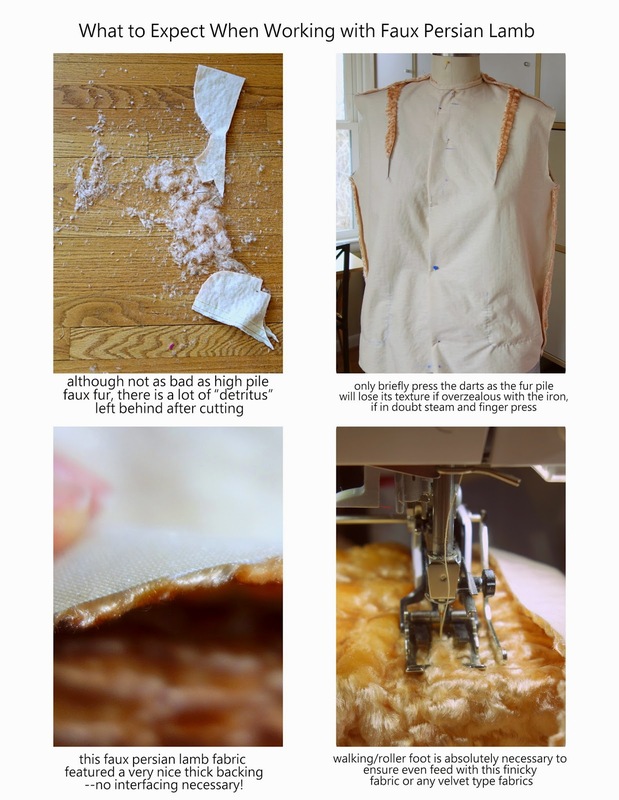 By the way, if you have some faux furs that have a higher pile to them, check out my fellow Fabricista's post on how to use them in your sewing. Wow Dina, I love both pieces! Very unique and I love the dress Dina. Great job! Hi, Jenese, thank you so much. I would love to see you make something up in a faux fur, I know you would do something amazing with it! Gorgeous outfit, Dina! It looks so pretty with your peaches and cream complexion. I love love love this duo. It looks great on you.